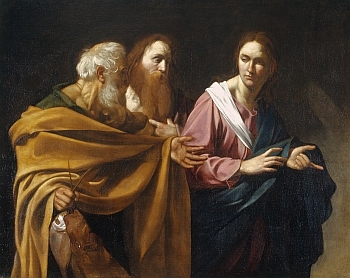 In the gospels, Andrew is referred to as being present on some important occasions as one of the disciples more closely attached to Jesus. Andrew told Jesus about the boy with the loaves and fishes (John 6:8), with Philip told Jesus about the Greeks seeking Him, and was present at the Last Supper. Andrew is said to have been martyred by crucifixion at the city of Patras (Patræ), on the northern coast of the Peloponnese. 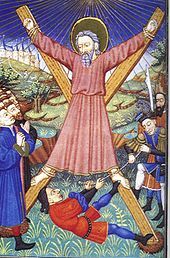 Early texts, such as the Acts of Andrew describe Andrew as bound, not nailed, to a Latin cross of the kind on which Jesus is said to have been crucified; yet a tradition developed that Andrew had been crucified on a cross of the form called Crux decussata (X-shaped cross, or "saltire"), now commonly known as a "Saint Andrew's Cross" — supposedly at his own request, as he deemed himself unworthy to be crucified on the same type of cross as Jesus had been. About the middle of the 10th century Andrew became the patron saint of Scotland. Several legends state that the relics of Andrew were brought by divine guidance from Constantinople to the place where the modern town of St Andrews stands today. Two countries have chosen St. Andrew as their patron - Russia and Scotland.